This is the last tip in my series of Top 5 Alternative Workstyle Tips. It is the follow-on to Alternative Workstyle Tip 4 – Find a Business Network. Okay, so this is one of those “duh” tips, but I find I’m still searching for things I need. Having the right tools to get work done and communicate from an alternative workstyle is obviously important. Everything from the hardware (do you need desktop or mobile, or both) to the software, to all those neat apps and gadgets that make our lives easier. Some of my favorite software, apps, and gadgets that I (and others in my network) use to run our offices are listed on my Skinny Scoop List of Tools/Resources. Early on, you should think through your systems, both paper and electronic. Your filing systems, accounting, even setting up your email, are just some examples of systems that if set up correctly from the start, can save you time as you grow. Organizational Consultants have done all of this thinking before and can help businesses set up these systems ahead of time. Everything from how your manage your paperflow processes to organizing your day. More Time for You and Organized to a Tee are examples of great companies that help businesses get organized and both have some tools and ideas listed on their websites that can help you if you are not ready to make the leap and hire a consultant for this. You will need to think through other potential consulting resources that will help you run your business. Depending on the type of company you have, you may need to consider attorneys, accountants, business insurance brokers and executive risk mitigators (such as my friends at Fifth Street Financial Group), marketing & communications professionals, human resource consultants. Given some thought to these services before you need them will greatly help you when the time comes. Of course, the number one tool I use (another shameless plug, since my company Duncan+Coleverria created it) is Flipside Workspace. Flipside Workspace is a virtual business park that allows me to engage with other users of Flipside Workspace, interact with professionals who have all sorts of expertise, and and take my online networking to a level that allows a more professional exchange of ideas. I work out of my virtual office which gives me the emotional connection to “going to the office” that I need, gives my colleagues, clients, and peers a place to always find me and know if I’m available to talk, and it gives me a place for me to pose those random questions that I need quick answers to from sources I trust. What are some tips and techniques you can share about staying productive in your Alternative Workstyle? P.S. If you would like an invitation to experience Flipside Workspace for yourself or with a friend/colleague (it’s always more fun to explore with a friend! 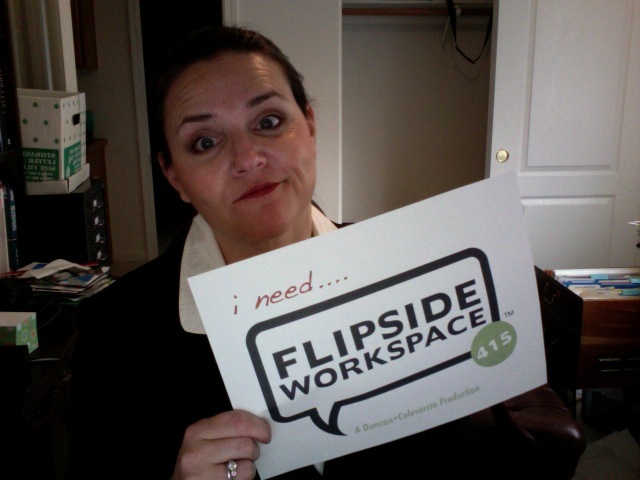 ), email us at hello@flipsideworkspaces.com and put “alternative workstyle” in the subject line and we’ll set it up! This entry was posted in Digital Workplace Concepts and tagged business challenges, flipside workspace, remote worker, work from home. Bookmark the permalink.